Dr. Scott Grogan graduated from Logan College of Chiropractic in 2011 and is a board certified Chiropractic Physician. While at Logan he took advanced coursework earning his Masters of Sports Science and Rehabilitation in 2012. Dr. Grogan achieved his Full Body certification in Active Release Technique in 2011, giving him a unique approach to the treatment of patients by addressing not only the joints, but also the surrounding soft-tissue. Dr. Grogan utilizes the “joint-by-joint” approach to patient care, realizing the importance of the kinetic chain, (ankles, knees, hips, shoulders etc.) and the impact it can have on the entire body. It is through functional analysis that he will locate the true dysfunction and source of the problem, to provide for an accurate diagnosis and treatment plan. Through mobilization of the joints and placing a heavy emphasis on soft-tissue treatment and rehabilitation, it is his goal to provide fast, effective care, and empower the patient to take control of their own health. 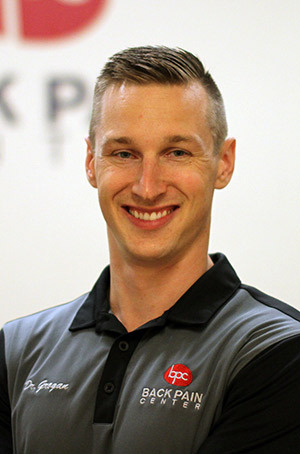 Dr. Grogan has a passion for athletics and is very involved with the Crossfit community, having both competed with, and treated several competition teams. He is the team physician for the Fort Zumwalt South Jr. Bulldogs football program and has previously been the team physician for State Fair Community College, Eureka American legion post 177 baseball, and for the Ballwin Race Series. Dr. Grogan is married to his wife, Amber, and has three children, Beckett, Remy, and Austin.